GeForce® RTX graphics cards are powered by the Turing GPU architecture and the all-new RTX platform. GeForce® RTX 2070 is light years ahead of other cards, delivering truly unique real-time ray-tracing technologies for cutting-edge, hyper-realistic graphics. Powered by NVIDIA Turing, GeForce RTX™ 2070 brings the power of AI to games. 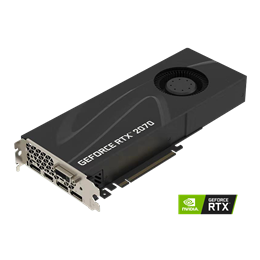 The powerful new GeForce RTX 2070 takes advantage of the cutting-edge NVIDIA Turing™ architecture to immerse you in incredible realism and performance in the latest games. The future of gaming starts here. Box Dimensions 6.76" x 12.21" x 3.53"
7680×4320 @60Hz RGB8-bit with dual DisplayPort connectors or 7680×4320 @60Hz YUV420 8-bit with DisplayPort 1.3 connector.